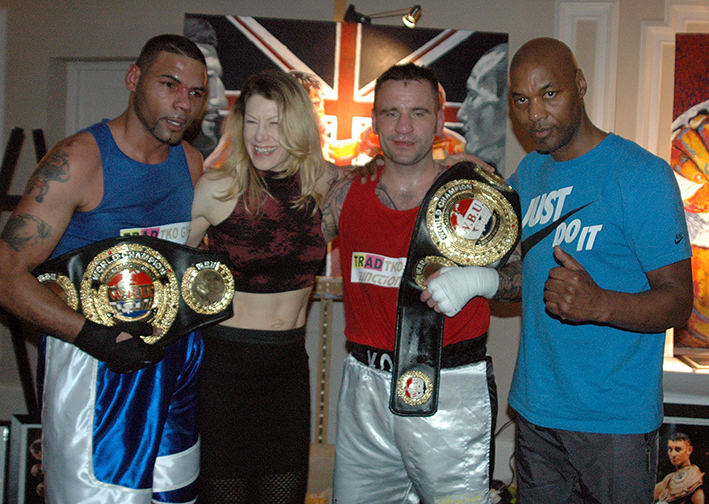 Former World Champions Wayne Elcock and Tony Oakey know a thing or two about winning Championships, so when they met up with Marianne Marston last weekend, at the TRAD TKO Boxing Gym in association with the World Boxing Union, Charity Boxing Event in aid of the Indee Rose Trust, they were quick to pass on some advice and voice their support to the TRAD TKO fighter, ahead of her World Boxing Union European title clash with Hana Horakova, which takes place at York Hall in Bethnal Green, London this coming Saturday. Wayne, who besides being WBU Middleweight World Champion in 2003, holds various championships including the WBF International title, which he won in September 2006, with a sixth round stoppage of Scotland’s Vinnie Baldassara. Just three month’s later Wayne beat Steven Bendall, with an eighth round stoppage finish, to secure the English title, before taking on and beating Howard Eastman in September 2007 to add the Lonsdale belt to his collection. Stepping back onto the World scene in December 2007, Wayne unsuccessfully challenged Arthur Abraham for the iconic IBF orange belt. Back in domestic action six months later, Wayne once again secured the British Middleweight title, which he unsuccessfully defended against Matthew Macklin in March 2009. Almost immediately after the headlining ‘sparring session’ with Tony Oakey last Saturday, the amiable Brummie was the quick to extend his congratulations, as well as pass on some advice, to Marianne. “This is a massive fight for Marianne, the European title, let’s be honest it’s a very valued title, it’s a high title to have you know let’s be honest, being European Champion is massive in itself, win this one and obviously it’s a stepping stone for the World. I don’t know much about Marianne’s opponent, but know she’s ranked higher than Marianne so is going in the favourite, she may be the underdog but I’m really hoping Marianne’ll win it. She’s got to focus, she’s got to pull the job off, it’s the greatest feeling ever, it’s massive when you win you’re first title. Tony has an equally impressive Championship record, having secured the World Boxing Union Light Heavyweight crown in 2002, before going on to successfully defend it three times before finally losing the coveted accolade to Matthew Barney, by split decision, in October 2003. Like Wayne, besides the WBU World title, Tony first secured the Southern Area strap in March 2001, just two months later added the Commonwealth title to his collection, two superb defenses later moving on to the aforementioned WBU World Championship campaign. It would be 2007 before another Championship belt adorned the Oakey family trophy cabinet, this time the Lonsdale belt, which he successfully defended before passing on the coveted accolade to Dean Francis in 2008. Tony then went on to win the Prizefighter Light Heavyweight title in February 2009, before adding the International Masters title four months later. Tony unsuccessfully challenged for both the English and British Masters titles before retiring in May 2010. Following photos with Marianne and her coach Brian O’Shaughnessy, Tony, who has known Marianne a while, having trained alongside each other at the TRAD TKO in the past, also was quick to voice support for his former gym mate. “I’m really pleased for Marianne, she deserves this, she’s always in the gym. I just said to her, take this with both hands, opportunities like this don’t come along too often, so make the most of it and come out of the ring knowing you gave everything.